Up close and personal. 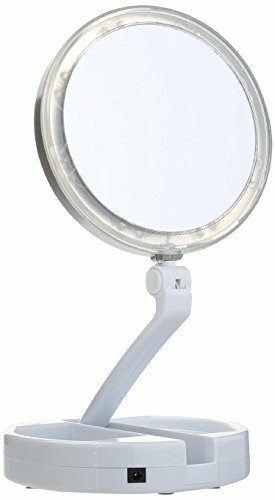 Perfect for travel, this two-sided vanity mirror offers 10X/1X magnification and long-lasting bright LED lighting that's ideal for applying makeup, tweezing your eyebrows, and more. Plus, its compact, versatile design can be used with or without a cord, and it folds flat for convenient storage. The diameter of the mirror is 5 1/4-inch distortion free glass, the diameter with lighted ring is 6 1/4-inch. Corded use requires adapter, not included. The mirror is made from distortion-free glass that is encircled by 10 bright white LEDs on each side, providing clear, crisp reflections enhanced by warm light. The dual-sided rotating mirror has 10X magnification on one side (ideal for applying makeup) and a 1X mirror on the other that offers a true, full-face reflection. The diameter of the mirror is 5 1/4-inch distortion free glass, the diameter with lighted ring is 6 1/4-inch.